The tension is rising: on February 24, the INHORGENTA AWARD 2019 will be presented in eight categories during an exclusive gala in Munich. The coveted trophy is awarded to the best designs and concepts from the international jewelry and watch industry. The high-profile jury headed by actress Bettina Zimmermann and top model Franziska Knuppe has now nominated three candidates for seven of the eight categories. The online vote for the Public Choice Award will take place until February 15. A record number of entries for the INHORGENTA AWARD, which will be presented for the third time on February 24! INHORGENTA received 140 entries—more than ever before—for the coveted award for the international jewelry and watch sector. The newly introduced “Design Newcomer of the Year” category, which went down very well, was one reason for this. Entries for the eight categories were received from nine countries. One piece of jewelry came from as far afield as Mauritius in the Indian Ocean. 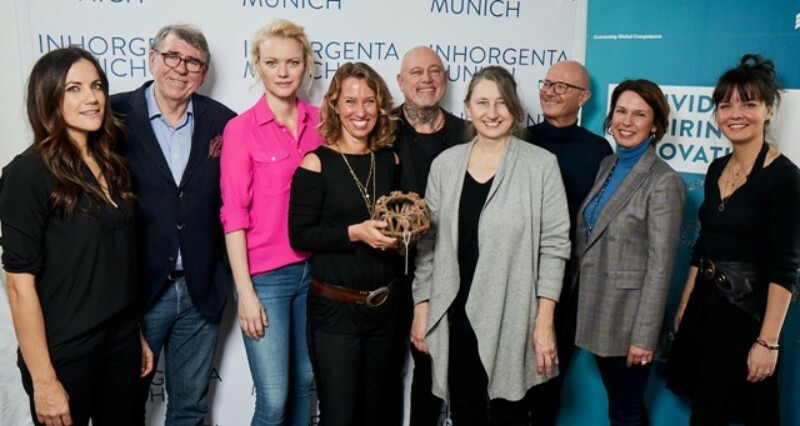 “This makes us very proud and shows that the INHORGENTA AWARD now has an established place in the international jewelry and watch industry,” said Stefanie Mändlein, Exhibition Director at INHORGENTA MUNICH. Once again, the jury this year was made up of high-profile individuals including actress Bettina Zimmermann, top model Franziska Knuppe, the designers Markus Hilzinger, Xavier Perrenoud and Patrik Muff, Professor Christine Lüdeke, Anja Heiden von Wempe, watch expert Gisbert Brunner and style expert Nicola Erdmann from ICONIST. “The entries were very impressive. The wealth of ideas and fine craftsmanship were evident everywhere. Working with my colleagues in the jury inspired me and was great fun,” said actress Bettina Zimmermann. The nine jurors spent half a day examining and discussing the 140 pieces of jewelry, design, concepts and watches submitted. After the votes, the lists with the three nominees per category were drawn up. In the Fine Jewelry category, the German manufacturers Gellner and Hans D. Krieger as well as the Spanish brand Facet Barcelona made it onto the shortlist. Bruno Söhnle, U-Boat and Bulova were nominated in the Watch Design category. Casio, Garmin and Alpina were the three favorites in the Smart and Connected Watches category. “Demand for smartwatches will continue to grow in the years ahead,” said juror and watch expert Gisbert L. Brunner. In the Fashion Jewelry category, Altesse from France, Concrete Jungle and Bernd Wolf were nominated. The nominees IsabelleFa, Brigitte Adolph and Corinna Heller are all hoping to receive the award in the Designer of the Year category. In the Next Generation Retail category, Weber, Haarhaus and Kinzel & Rall were nominated. Alessa Joosten, Karin Heimberg and Gitta Geschmück are on the shortlist for the newly introduced Design Newcomer of the Year category. The nominees in the Public Choice Award category will be chosen through a public vote. Votes can be cast at www.inhorgenta-award.de until February 15.